My birthday was yesterday and thank you all for the wonderful birthday wishes. I am so happy for the online sewing community and friends that I have made over the years. You guys are amazing and mean the world to me. I celebrate my birthday all month but usually do some kind of gathering close to the actual day. Of course a celebratory gathering calls for a new dress. This year I chose McCall’s 7429 which I’d had my eye on since it came out. I’ve never made a twist knot dress before although I have seen patterns around but something about this one compelled me to take the plunge. I’ve seen a few of these made up and the dress looks great on many different shapes so of course I had to give it a shot. Pattern Description: Close-fitting pullover dress has front twist detail at waist and neckline variations. A, C: Sleeveless. A, D: Mock-neck collar. B: Long sleeves. D: Short sleeves. Note: No provisions provided for above waist adjustment. Were the instructions easy to follow? ABSOLUTELY NOT! What did you particularly like or dislike about the pattern? I am definitely enamored with the style and I think it’s super flattering on me and everyone else that I’ve seen it on, however, the instructions go completely south when it comes to assembling the dress from the twist on. Luckily I’m confident in my sewing abilities and understand construction so I ended up abandoning the instructions after a bit, laying the dress out first on the floor to figure out what went where for the twist and then later pinning the front on my dress form to figure out the construction after the twist. The skirt portion of the dress is actually a wrap skirt which you can’t really detect from the pattern pictures or line drawings but certainly would have been helpful to know at the beginning of construction. 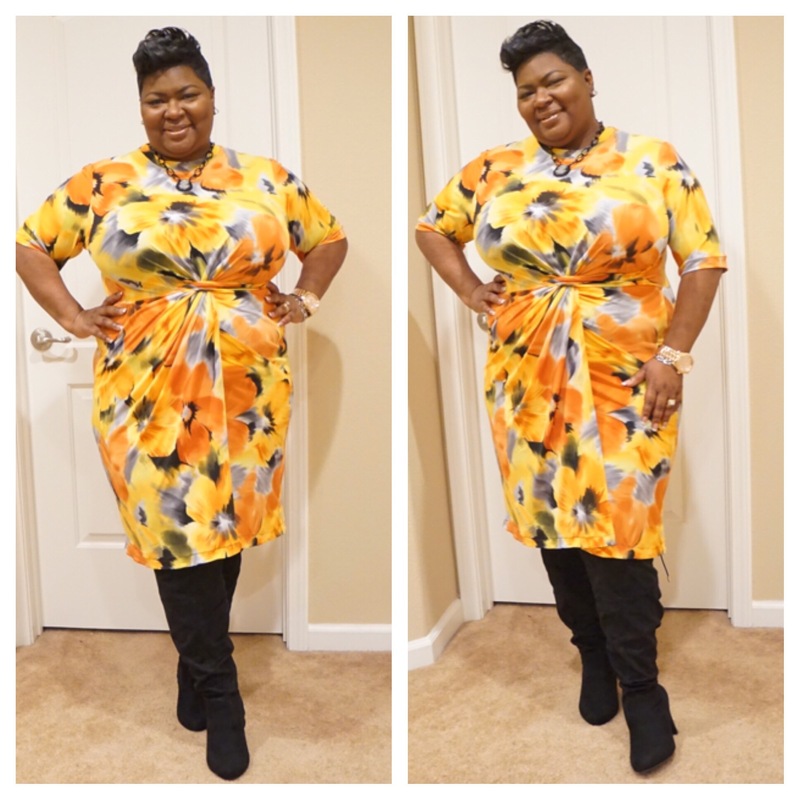 Pattern alterations or any design changes you made: I had seen this dress on someone who I know is the same height as I am and knew I wanted the dress to be slightly longer because I like my dresses to hit just below the knee so I added two inches to the hem. I also shortened the sleeves for the view that I made which was View B but I used the shorter sleeve of View D.
Would you sew it again? Would you recommend it to others? This dress gave me fits because of the instructions but once I figured it out, it really is a pretty easy sew. Once I get back on speaking terms with this pattern, I’m sure I’ll make it at least once more because it is very cute and has lots of possibility. Conclusion: This pattern results in a great, very flattering dress and is something that you can make and wear year round with all of the options BUT be sure to read through the instructions and study the design lines of the pattern so that you get an idea of the construction of the dress before you start the sewing. My boots are over the knee boots found at LaneBryant.com. FAB! right? that looks fantastic, and great fit. that pattern is a keeper and I could imagine it in a variety of fabrics. Wow. That dress is absolutely amazing on you. I love it when the right pattern and the right fabric meet the right sewist (whichever term you prefer) and WHAM. That’s what’s supposed to happen! So beautiful. I LOVE THAT ON YOU! I have only started following your blog recently, and this is so bright and cheery and flattering, and the boots are great with it. Enjoy and happy-extra-birthday time! Came out great!!! I drank 2 glasses of wine before I could even begin to deal with that darn knot! Worth it in the end! Look, I don’t even drink and I felt like I needed a beer. Luv the fabric and the shape. I may give it a try too. And Happy Birthday! You look fabulous in this dress! Perfect fabric, perfect pattern, perfect fit equals amazing dress! I have to agree with the others, this dress is great on you! I love it!! I need this pattern in my stash so I can sew it up. Happy belated birthday! So super cute! I love bright cheery colors and this one is an awesome one! This dress is gorgeous on you and so worth every bit of frustration! You answered all my questions!!!! Thanks for the perfect review.